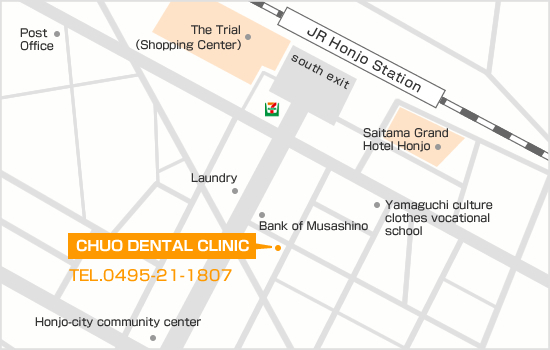 Chuo Dental Clinic is located in Eki-Nan, Honjo. We provide the latest treatment to patients of general /child dentistry and implant and orthodontic dentistry. Preventive dentistry is equally valued at our clinic, where patients receive proper oral care instructions and treatments to maintain cavity- and gum disease-free condition. Chuo Dental Clinic is a contracted clinic of Waseda University Student Health Promotion Mutual Aid Association. Waseda University students can claim reimbursement of medical fees at our clinic for certain treatments. More information is available at Waseda University. ※English service is available for international students. We might request the assistance of an interpreter during more complex procedures and treatments. COPYRIGHT (C) CHUO DENTAL CLINIC,ALL RIGHTS RESERVED.